Our specialty blades offer long-lasting cutting performance and many of our blades provide optimal resistance to wear and corrosion. We can shape and hone our industrial blades precisely through a specialized multi-step process performed by programmable Computer Numerical Control (CNC) machinery. This puts us head and shoulder above some of our competitors, as we are able to move beyond the typical steels available in strip form. Also, we have the capability to create unusual or unique edge configurations—perfect for equipment manufacturers that need original industrial speciality blades for brand-new inventions. Because of our ability to create industrial blades of any angle or shape—and the wide range of materials at our disposal—Cadence has grown along with our customers, and we will continue to stay ahead of the pack. We're responsive to our customers' needs and are eager to get creative to fulfill unusual requirements. 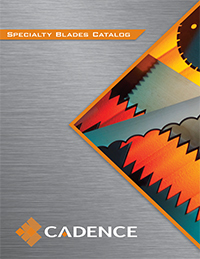 Visit our new Cadence Blades website today to view all of our standard blades.